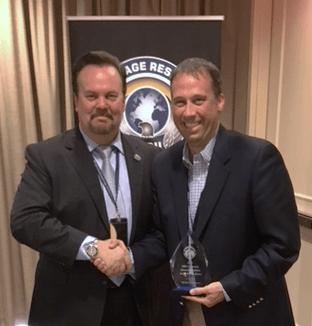 On September 10, REI was presented with the Glenn H. Whidden Award for Best New Equipment at the 2016 Espionage Research Institute International (ERII) conference in Alexandria, Virginia. The award was presented for the Advanced Near-field Detection Receiver (ANDRE). The ANDRE is a handheld broadband receiver that detects nearby ambient RF energy. It is a professional tool for detecting known, unknown, illegal, or interfering RF transmissions across a 10 kHz to 6 GHz frequency range. REI is continually developing new products to equip technical surveillance countermeasure (TSCM) practitioners. The ANDRE will replace the CPM-700 Broadband Detector, a staple in REI’s product line for many years. The ANDRE provides advanced detection capabilities with multiple probe antennas for investigating specific bands within an optimized detection range, a histogram and time chart display of signals, and audio demodulation functionality. Pictured are ERII’s Director, J.D. Leasure (L) presenting the award to Lee Jones (R) of Research Electronics International (REI). Mr. Jones accepted the award on REI’s behalf.